Isn't Sculpey hard to work with.....? Not really. It doesn't dry, it holds its shape well, it's temperature sensitive to your fingers so you can easily get it soft or hard. And it's a polymer so it's very very smooth. The hardest part for me is getting the wire framework right because if you screw up the proportions at that stage and don't realize it till later, it's very hard to fix. And the weight of the clay bears down on the wire and changes the pose. But I would much rather work in super sculpey than stone or even clay. Oh, awesome! :D Do you do sculpture often? About how big is that? 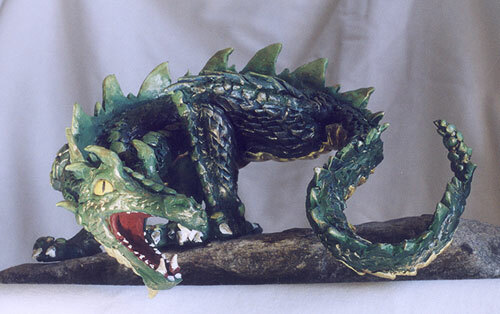 This is really bringing me back to my childhood- back in early middle school I went through a phase where I made a ton of little dragons out of wire, foil and sculpey. It's about 8 inches high, a foot long at the base. I made some dragons too. You've probably already seen this one.